Unlike a lot of the Cleveland dining scene that’s either downtown around 4th Street, or over in Ohio City, Sokolowski’s is nestled into the north end of Cleveland’s Tremont neighborhood that’s cut off from downtown by the Cuyahoga River, and cut off from Ohio City by I-90 (indeed, the owners of Sokolowski’s must have been mighty nervous during the planning stages of the Interstate). It’s a pleasant neighborhood, one of Cleveland’s older ones, with a lot of Victorian houses, small eateries, and the like (and the famous house from A Christmas Story). 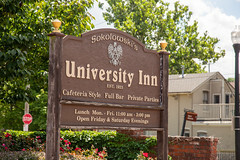 Sitting just off the bluff at the north end of the neighborhood, Sokolowksi’s University Inn (named after University Rd, which is in turn named after the long-departed and short-lived Cleveland University) has been serving up beverages and food since 1923 (although some of the dining rooms are from later additions). 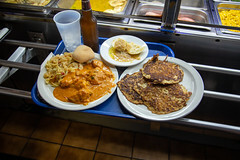 Sokolowksi’s is nominally a cafeteria-style restaurant serving up Polish food, but if you delve down into the menus and specials a bit, the menu is a bit broader: alongside all of the traditional Polish foods sit some Hungarian items (like a Paprikash), some English items (Salisbury Steak), German (Bratwurst), and even American (Maryland Crab Cakes if you go on a Friday), so really, it’s more of a “comfort food” assortment. 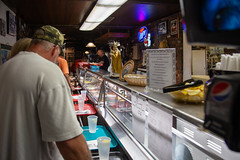 After moving down a cafeteria line selecting your beverages (including beer), you’ve got a pretty wide assortment of dishes available across the comfort food spectrum. Since it had been several years since my last Sokolowski’s trip, I really did try to get enough items to hit some of my Eastern European cravings. And of course, that means starting with some pierogi. 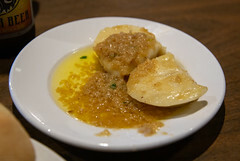 On the face of it, these are your standard potato and cheese pierogi, but the execution on these is perfect: the dough itself is rich and toothsome with a little bit of a sour cream bite to it, cooked up just to the point of still being slightly toothy, and then sauteed in a mix of butter and diced onions. Sure, it’s pretty much a cardiologist’s picture of “what not to eat”, but these are thoroughly flavorful and perfect in texture. Next up: potato pancakes. 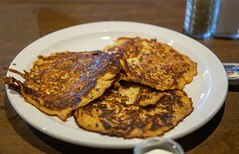 Over my years I’ve run into two styles of potato pancakes: those made with shredded potatoes (I usually call these latke-style, since most “latkes” I’ve had are like this), and those made from a smooth batter. There’s merits to both, but when eating Polish food, I love the latter, usually cooked to a near-burnt crisp (probably because all sorts of family dinners with potato pancakes growing up served them like that, in fact, I almost taste kielbasa just thinking about them). And the ones at Sokolowski’s are perfect for this style: thin and crisp, just ready to soak up a bit of butter or sour cream. 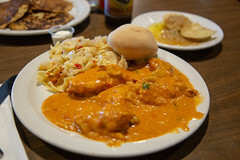 For my main course, I shifted to “Hungarian” and went with one of the Friday specials: chicken paprikash. Served up with a nice bed of noodles and cabbage, this was a rather good rendition of the classic Eastern European comfort food: nice tender chunks of chicken and onion in a perfectly creamy but peppery and smoky paprika sauce, the latter perfect for chasing up with the bits of noodle or some of the potato pancakes. Again, a winner. 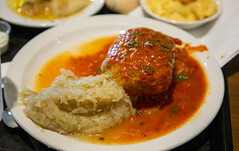 But for one of the most impressive dishes of the visit, we have to turn to Carol’s selection: the cabbage roll. A rich and flavorful mix of pork and rice with a light spicing wrapped in cabbage, served up with a rich peppery sauce, this was one of the better cabbage rolls I’ve had, indeed, it was in the same class as Kramarczuk’s. Anyone knows me knows that I love pizza. I’ll further admit that I’m a pizza snob. Growing up, I was taught by my Connecticut-raised father that there is One True Pizza, and that’s the pizza (err, Apizza) from Frank Pepe Pizzeria Napolitana in New Haven, CT, with begrudging acceptance of a choice few other places on the planet (most of them near New Haven, like Sally’s, and The Modern). Over the years, I’ve learned that there are a lot of other good pizza places hiding out there, turning out pizzas whose crust, sauce, or cheese (mostly the crust) are head-and-shoulders above the rest. Pizzeria Bianco in Phoenix. Pizzeria Delfina in San Francisco. American Flatbread in Waitsfield, VT. Grimaldi’s in Brooklyn. Patsy’s in Harlem. Lombardi’s in New York City. The last two of these show that if there’s a home to pizza in America that’s not New Haven, it’s New York.